Scribe Software Corporation provides cost-effective, no-coding data migration and integration solutions for Microsoft Dynamics business applications. Scribe solutions are simple to configure and provide ease of modification as business processes change. Scribe Insight has been specifically designed to support the effective deployment of a number of market leading business applications, including but not limited to Microsoft Dynamics CRM, Microsoft Dynamics GP, Microsoft Dynamics NAV, Salesforce, and SalesLogix. More specifically, Scribe Insight enables customers to quickly and seamlessly integrate their mission critical applications with other applications and data stores in the enterprise. Scribe Insight is the core technology that forms the basis for Scribe’s migration and integration solutions. Utilizing a unique and open template model Scribe Insight allows the quick and efficient configuration of any data integration or migration to meet their specific needs, all without having to write a single line of code. In short, Scribe is the fastest and most comprehensive way to integrate these applications into your business, in precisely the way you need them to work. The Scribe product family is comprised of Scribe Insight, Scribe Adapters and Scribe Templates. 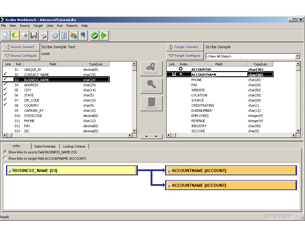 Scribe Workbench – a rich graphical environment in which you can create template files that define source and target data connections, data cleansing rules, data mappings, transformation formulas, and data processing logic. Template files created by the Scribe Workbench are reusable, portable, and easily modified. Scribe Console – provides an intuitive user interface and single point of management to create, control, and manage key aspects of any number of data loading or integration processes. Scribe Integration Server – facilitates the exchange of data between two or more applications or databases. Scribe Adapters enable the Scribe Insight product to communicate seamlessly to a variety of applications, databases, messages, and files. The automation of common data loading tasks such as assigning primary ID values, setting default values, and validating input data, and setting object relationships all designed to eliminate run-time errors and provide for greater data integrity. Dynamic discovery that presents the unique configuration of each application or database instance to the Scribe Console and Workbench at run-time that adjusts to changes in the application or database schema without requiring recoding or recompiling. The seamless integration of application and database error messages to provide detailed exception reporting and handling from the Scribe Console’s single point of management. Scribe Templates are the combination of data mapping and data parameters you design within Scribe Insight. Solution Templates represent a complete, fully functional integration or migration solution between two applications. Examples of these include migration solutions for ACT! into Microsoft Dynamics CRM, SalesLogix, or Salesforce and front to back office integration solutions between Microsoft Dynamics GP and Microsoft Dynamics CRM or Salesforce. 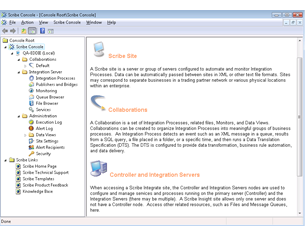 Scribe’s unique template model provides “out of the box” functionality for these integration scenarios, built over its industry leading integration platform. Because most customers have business needs unique to them, these standard Templates can be quickly extended and customized utilizing the GUI-based mapping and development environment. Component Templates are starting points for common integration processes used by customers that are implementing an integration solution for which Scribe, or a Scribe partner, has not developed a Solution Template. For example, Scribe provides Templates that integrate customers, products, orders and invoices between a Scribe-developed sample ERP system and Scribe’s targeted CRM applications including Microsoft Dynamics CRM, Salesforce, and SalesLogix. A customer that was looking to integrate one of these applications with their own ERP application, can utilize the appropriate Component Template as a significant starting point. Typically these Component Templates provide between 50% and 70% of the end solution with the remainder configured with Scribe Insight.